City Sounds is proud to be a supporter of local art and local artists. Here are the talented creators who designed pianos for the 2016 season. "My artwork starts directly from the elements of design. Color has always intrigued me from the bright pink of bubble gum to the dark blue of the night sky. Recently I’ve been fascinated by texture and how it physically changes how we perceive space. Most of my pieces are based upon fragmented memories, past, present or dreams that come to surface over time." I am an artist, designer, photographer and overall creative person. I also co-founded the DSM girl gang. 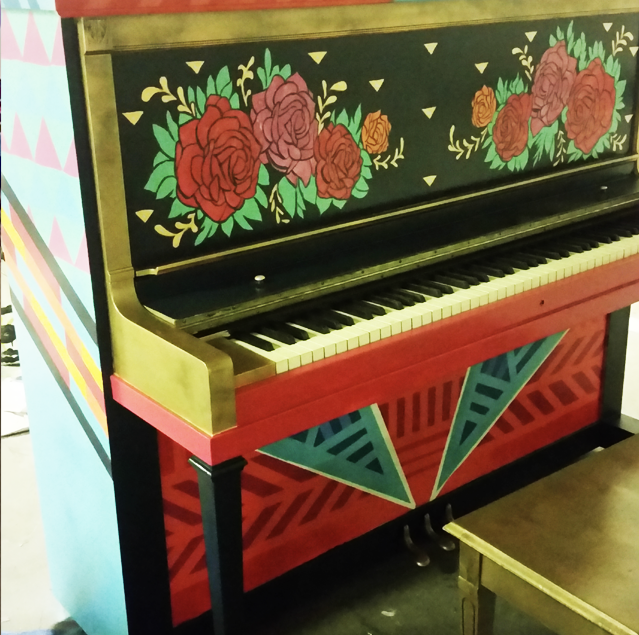 For her piano she used a handpainted pattern utilizing a new or past pattern design. "I am a young emerging visual artist. I feel attracted to the contrast of cultures, to the collision between customs and traditions. My recent work speaks of identity, fragmentation and the way it can lead to unity. I incorporate elements of crafts and popular arts into my own work. Papier-mâché, tissue paper, crepe paper, thread, and cartoneria merge into a more contemporary art esthetic." ArtForceIowa seeks to offer the most at-risk youth in the community a supportive environment where art rules. All programs are based on our three force model. The model incorporates life and work skills, mentorship, and advocacy into the art of creative expression. Michael Van Dyke is an artist with an investigative and curious approach, utilizing a wide range of mediums to express abstract and non-representational art. Michael’s time spent as a graphic designer has led to a mix of experiments with graphical and organic elements to convey emotional reaction by challenging the viewer’s eye through line, shape and color. Hilde De Bruyne is a Belgian artist who lives in the USA and specializes in Clay, Metal & Bronze sculptures and murals. Her piano was inspired by the collages of Matisse, especially "Jazz", Belgian Surrealist Magritte and Piet Mondriaan. "I am a recent college graduate from Grand View University. Majored in Graphic Design. Originally from Bosnia but moved here at a young age. I enjoy to illustrate random monster characters that just pop in my head everyday. I enjoy snowboarding and going to the art center." Christine Hilbert is a mixed media painter and jewelry designer based in West Des Moines, Iowa. She combines vintage treasures of all kinds to create art work and jewelry that echoes the past. Christine earned her BFA from Iowa State University and also studied painting at the Savannah College of Art & Design. "I've had love affairs with words and art for my entire life. As a hand-lettering artist, I now spend my free time fusing the two, creating murals, signs, commissioned artworks, logos and more. My clearest goal in life is to make the world a prettier and more thoughtful place through my work." "I been making art in the Midwest for over a decade and love working with all kinds of mediums. My preferred mediums currently are wood, spray paint and acrylic"
A native St. Louisan, Kate Moore adopted Des Moines as home in 2014 and hasn't looked back. She works as a graphic designer, illustrator, and all-around obsessive maker. She lives in Beaverdale with her dog, her husband, and usually a large amount of cheese. Jami Milne is an artist, wife and mother, specializing in photography that captures often obscure and unnoticed moments. 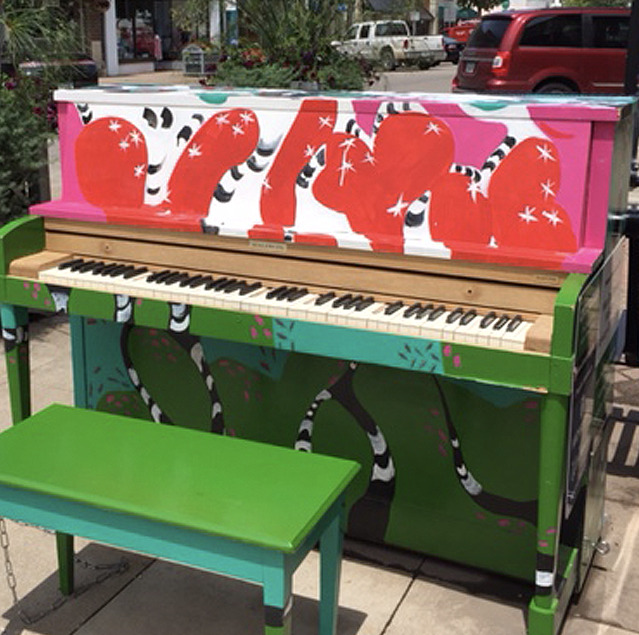 "I am interested in covering a piano with black and white imagery specific to Des Moines – people, places and icons of our city."